Hey, what’s this? 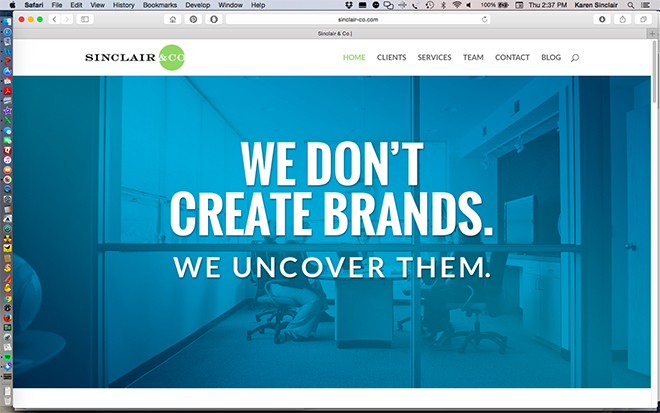 A new website at Sinclair-co.com. So we finally did this thing. After a year of saying that we needed to create a new website, we finally launched one last month. Let’s take a look around. First, meet some of our impressive clients. Click on a link and you’ll see samples of our work and a little background on how we support each client. Keep scrolling once you’re there. There’s a lot to see. Want to see the breadth of the services we offer? You’ll find a comprehensive overview here. Next, meet the team. Yep, that’s us. No comment on the age of the photos. And don’t forget our recently revived blog, Sinclairity. We’re really, really going to keep it current this time. Pinky swear. Special thanks to our own Candice Lyna, who gave birth to this website just before she left to give birth to the adorable Benji (7 lbs., 10 ounces). And to Art Director Extraordinaire Steve Davis for the fabulous design. And last but not least, to Programmer and All-Round Good Guy Scott Reston. It couldn’t happen without you.